Andy Robertson feels that Mohamed Salah’s absolute screamer against Chelsea yesterday has silenced some of their fans, whose abusive Islamophobic and racist chants were criminal and unacceptable. That wonder-goal hit the back of the net only three days after a video began circulating on social media showing six Chelsea fans singing ‘Salah is a bomber’ before their Europa League game at Slavia Prague. Speaking to Standard Sport, Robbo said: “There was a bit of stuff that had gone on in the week and that’s the way to shut them up. At Anfield, Salah stifled them with a sublime 25-yard belter to beat Chelsea and secure us the win. 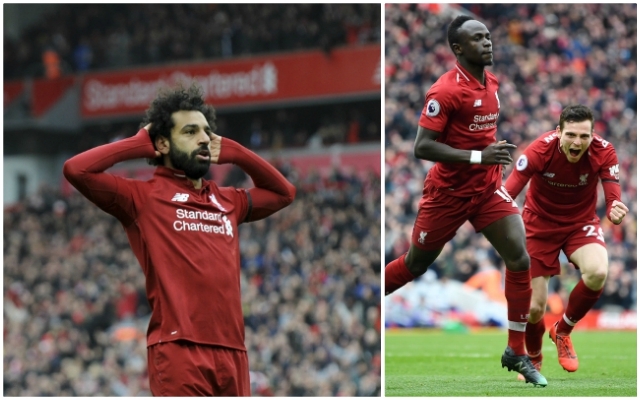 Like Xherdan Shaqiri, Naby Keïta, and fellow-goalscorer Sadio Mané, Salah is a Muslim and that footage caused rightful outrage as Chelsea sought to ban the perpetrators. “The club released a statement on the day and Mo was fine about it. It’s not nice but he dealt with it. It didn’t affect him at all – it didn’t look like it, did it?”, Robertson rhetorically asked. Despite the perfect oberservance of a minute’s silence for the 30th anniversary of Hillsborough from the away fans, there were worries that Islamophobic crowd abuse could mar the game and distress Salah. “It was a fantastic goal. He cut inside and clearly fancied his chances. As soon as he hit it, everyone knew that it was in. The place went wild and fair play to him,” the Scot continued. We think it’s unfair too. Last season, Salah was another planet, this season he’s one of the best on Earth. No one has scored more league goals than him this season and the fact he’s still in the running for the Golden Boot confirms that he’s certainly not a one-season wonder. Far from it. Apparently, Chelsea have already identified three of the guilty men and are hunting down the other half their deplorable group. They need to be held accountable!